- To incorporate the project products and use them in vocational and continuous training activities. 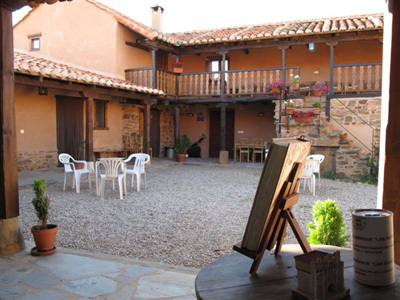 It is a rural tourism guest house located in Benllera, León. This entity is willing to participate and collaborate in all the activities described in the memoranda of agreement model, according to their possibilities. It is a rural tourism guest house located in La Omañuela, Riello, León. To be able to offer some of these activities, they cooperate with other active tourism entities of the area, so that the offer can be broader for the costumers. It is an active tourism entity located in Cubillas de Arbás, León. They are devoted to many types of leisure and active tourism activities (abseiling, climbing, canoeing, cycling tours, archery, snowshoes, mountain activities, orientation tours…) and they also have accommodation facilities in a very beautiful and relaxing rural area. - Plan management and technical support. - Services for the population. - Valorisation of local products. - Valorisation of cultural and architecture heritage. - Training and employment activities. It is a city council located in Puebla de Sanabria, Zamora. It is a very active city council that tries to promote their small but beautiful and historical village, which contains very interesting historical and artistic elements and which is placed in a very beautiful area surrounded by different natural parks and Regional Reserves. Public entity located in the territory of Gordón, in the area know as Central Mountain of León, near the Cantabrian Mountain Range. This territory is close to Bernesga river and has a surface of 157 km2. It has 3989 inhabitants distributed between its 17 localities: La Pola, headquarter of the City Council, Huergas, Los Barrios, Beberino, Buiza, Cabornera, Ciñera, Folledo, Geras, Llombera, Nocedo, Paradilla, Peredilla, Santa Lucía, Vega, La Vid and Villasimpliz. This City Council is included in the Biosphere Reserve of Alto Bernesga. This municipality is located in the province of León, in the plateau area, and belongs to the territory called Esla-Oteros. From the beginning, the city was placed in the fertile plain of the river Esla, fact that favoured the agriculture characteristics of all the inhabitants in the area. Nowadays, 80% of the territory surface is devoted to cultivation purposes. Valencia de Don Juan is provided with advanced infrastructures that facilitate a confortable and high quality of life of the inhabitants and visitors. In the city, beautiful traditional and contemporary architecture examples can be admired; as well as beautiful landscapes ideal to different kind of activities can be enjoyed in the surroundings. GUHEKO S.L. is an enterprise specialised in services related to leisure such as active tourism activities, environmental and nature education activities, training activities, activities for enterprises, activities for children, etc. Founded in 1993 and placed in León, it was one of the first enterprises specialised in leisure activities in Castilla y León and has been growing up, both in number of offered services and in number of specialised staff working in the entity. Nowadays, the entity has a broad and quality offer designed by professional staff and addressed to all kind of customers, so that they can enjoy their leisure time through innovative, exciting and enriching activities. The enterprise has a technical team of 40 professionals (organised in different technical, administrative and management areas and departments) able to carry out the management of big projects and to offer a high number of services. GUHEKO has management and customer service facilities in the city of León, as well as other facilities in the surrounding mountains, where they manage the Active Tourism Centre of Vegacervera. The Guest House Las Águedas is a different rural guest house. It is located in a unique 19th century building of the Maragatería region, in León. 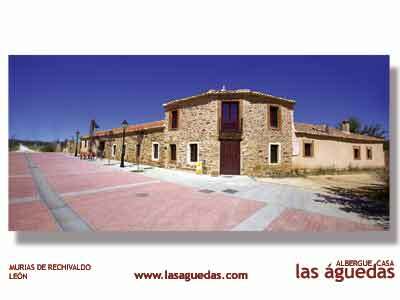 It is specifically located in Murias de Rechivaldo, in the municipality of Astorga. The St James' Way and the Silver route cross this territory. This 52 vacancy guest house is perfect for pilgrims, groups of people, families, associations, meetings, sportmen…and it is built with no architectonic barriers, which allows a total access to all kind of visitors. The activities offer is so broad: hiking, cycling, mountain sports, culture tourism, sport tourism, gastronomic tourism and active tourism are available. Rural and active tourism for everybody. AGROMONTANA is a non-profit association located in León, Spain. Created in 2005, its main activities are related to the employment promotion in the rural areas (specially for rural women), the promotion of sustainable development and the promotion of natural resources of every region, taking specially into account the development of the organic agriculture and the sustainable tourism activities. Through these actions, the association intends to dinamize the economy of the most disadvantaged areas (due to their geographical isolation), keeping their cultural identity and preserving the biodiversity of their environments, as well as improving the qualification of the inhabitants of these areas. 11. 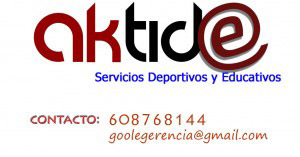 AKTIDE SPORT AND EDUCATIONAL SERVICES S.L. It is an enterprise devoted to Sport and Educational Services, formed by different professionals belonging to the primary and secondary educational field and to the sport field, all of them having the corresponding university degrees. All the activities of the enterprise are designed, directed and coordinated by graduates in Physical Education or Pedagogues. Thus, they try to offer the best quality and safety in each service. Besides, the entity knows well the real needs of the sector and tries to offer the maximum quality without subcontracting any of its services. On the other hand, they offer a personalised treatment to the customers, as they are conscious that every person is different and must be treated individually according to his/her needs. Is a Non Profit National Organization with Legal Personality; it was founded as “ Association”. It is composed by different physical and juridical Entities and Organizations, Associations, SME, and Social Agents who have a huge experience in managing rural developing by carrying out both training actions and by creating new employment fields. (self employment, rural cooperatives and rural SME). The Adesper main objective is avoiding the high level of depopulation in rural areas; Adesper wants to fix population in those rural areas as well as promoting social and economic conditions in rural environment. It is a company founded in 1996, offering services of design, layout and publishing ever since. In 2009, the company moves to Cistierna, León, where it begins to provide work and signage projects of hiking trails and environmental interpretation panels. 1 - Making rural development projects, initially focused to enviromental tourism and active tourism through signaling hiking paths, climbing areas, interpretative panels, courses, conferences, etc..
2 - Nature tourism activities, making hiking trails with environmental interpretation, bird watching, mycological and photographic routes, education activities with schools, youth and disabled people. ECOPERIA is a non-profit entity framed by the concept of social enterprise that fixes as its business goals the creation of positive impacts both socially and environmentally. The activities and projects undertaken by the organization are mostly those that promote development and tourism in rural areas, organic farming and environmental sustainability in order to maintain and restore the activity in the villages of the Spanish geography. Among these activities are also those related to the ecological, social and economical sustainable active tourism, promoting a tourism based on local resources, respecting the environment and satisfying the tourists´ needs. 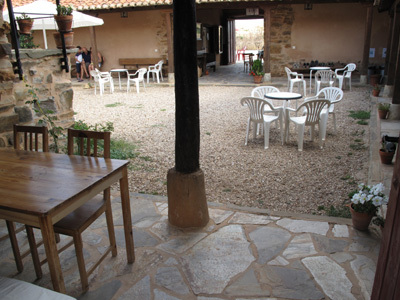 Association of young people with difficulties to the access to the labour market, whose field of work is the rural tourism and shelter management in the Saint James way. Supports and collaborates with groups at risk of social exclusion by promoting their social integration in the area of cultural and environmental tourism. The hotel offers active holiday facilities for guests as an extra offer to its basic services, cooperates with local suppliers of food and services. Opportunities for cooperation are in development of active holiday products. Guest house offers serveral nature trails with active tourism and nature educational elements for children. Opportunities for cooperation are in further development of holiday activity products for groups. Guest house offers sports games facilities for guests and water based activities. Opportunities for cooperation are in further development of active holiday programmes. Guest house offers a variety of outdoor facilities for guests, like tennis, catamaran, water bikes and boats. The owners are interested to further develop in the field of active tourism. Oportunities for cooperation are in development of active holiday products. The hotel offers a number of activity facilities: bicycles, boats, catamarans, sailboats, waterskiing and wakeboarding, skiing and skating. Oportunities for cooperation are in development of active holiday products. Log house with banquet hall, kitchen corner and sauna is located 6 km from Lielvarde. There are 2 bedrooms with balcony and living room on the second floor. Hot tub next to the house and black sauna in a separate building. Horse riding. A comfortable rest stop for those touring Kurzeme, 5 km from the centre of Kuldīga along a good road. Guestrooms in a separate building, guided walks in the local area. A pond near the house. Lake Usma's fishermen offer log cabins with a sauna, motorboat trips on the lake, water ski rentals, fresh and smoked fish, horse riding. The old watermill. Once flour was milled and movies were filmed there, now - a guesthouse with cosy rooms for seminars and parties - 2 large halls, sauna, whirlpool. Boat trips on Lake Dzirnavu, well laid out playing fields. A pleasant sojourn at the well equipped guest-house on the shores of Lake Zvirgzdu. Party rooms, sauna and well appointed rooms. Camp huts for fishermen. The renovated estate complex from the 16th century is located in 20km from Saldus. Different standard rooms for guests in the hotel and cottages accommodating totally 150 persons. Party rooms for 200 persons. Spacious are for sports events, catering services, a sauna with a slide into the pool for private events. Mini golf, rough-terrain route, a swimming spot, boating. Excursion programs for groups. Thematic events throughout the year. In summer – family holidays in a cottage in tranquil setting, free activity facilities. 3 comfortable cottages by the Lake Durbe. Each cottage has 2 bedrooms, a sauna, a kitchen, a living room with a lake view. A country sauna with a lounge for 15 pers., bedrooms on the 2nd floor. A picnic spot, a terrace, TV, Internet. Sports grounds and children playground. Tent places and trailer parking available. A guest house in the dunes, 100 metres from the sea and just 5 km from Liepāja. On the first floor separate entrances in two parts of the building - a party room for 60, fireplace room for 20, sauna. Bedrooms with shower/WC on the 2nd floor. A hot tub on the open terrace by the house. Campsite nearby with room for tents and connections for 10 trailers. Tasty meals in the summer cafe "The Hey Barn". Not far from Lake Austriņi, on the shores of a pond, a cottage for family relaxation or small parties. On the first floor - a sauna, kitchen and dining room. One bedroom on the second floor. From the sauna an exit to a terrace. Guest house with seminar hall and 8 rooms is located near Cesis, just 5 km from Rauna. Sauna in a separate building. Horseback riding, boat rental, fishing and snowmobile offered in winter. A family home on the Lake Baužezers shore, 5km from Vaidava. Guest quarters with separate entrance: a bedroom, a living room with extra beds, a kitchen. Dry toilet in the corridor, shower in country sauna (10m from the house). Excellent fishing spots in the lake. Paddle boats and rowboats. Amid Daugavpils, Rēzekne, Krāslava and Preiļi, on the banks of Lake Cirītis - eight bedrooms in a guesthouse with party facilities. Country sauna with fireplace for 35 people. Swing-sets for children. Sauna specialist available. By the lake, secluded location. Fully equipped cottage for guests. Basketball grounds, mini-football, hockey, volley-ball, boating, fishing, mushroom and berry picking. Sauna with a prefessional sauna expert. On Lake Drīdzis, facilities for family holidays or company events - 6 cottages for four to six. Each has a kitchen, refrigerator, mini-bar, guestroom with TV, sauna, shower and WC. A two-floor house with sauna for parties of 60 to 70, with bar and four bedrooms. Tenting and a lean-to with fireplace on the shore of the river. A hall for parties or seminars for up to 30 persons on a peninsula in Lake Ciecere. Accommodations in 4 place teepee-type huts. Boating excursions to an island and in the lake. Fisherman's house built in 1930, 20 km from Liepāja. Separate entrance for guests. Double, triple and four-bed bedrooms. Country sauna with summer lean-to. Open sea nearby. Tenting, two trailer connections. Pāvilostā, pašā Baltijas jūras krastā pie jahtu ostas, kempings ar 4 brīvdienu mājiņām, plašu teritoriju teltīm (vairāk kā 200 vietas) un treileriem. Servisa ēkā četri numuriņi ar skatu uz jūru. A holiday complex 3km from the centre of Tukums. TWIN, DBL and family rooms. A pub with a terrace. 4 different size function rooms. Seminar facilities. Camping by the Jumpravas lake. Volley-ball, street-ball, children playground, quad rides. SPA bath, sauna. Nature trails in the arboretum. A castle built in 1901 as a hunting castle for the then mayor of Rīga, George Armitsted. It is located in a tranquil place, among hills. The castle hosts a 3-star hotel, seminar facilities for 10 to 400 persons, a room for wedding ceremonies and rooms for parties. Excursions for newlyweds, a museum, a picnic spot. Rest and recreation on the shores of Lake Ciecere. Guest-house for overnighting, seminars, banquets. Cottages, water skiing, paddle boats, trips by jeep in „roadless” park, country sauna. A country home between the sea and Lake Liepāja, 7 km from Liepāja. Four guestrooms in a separate house, with WC, shower and small kitchen. Small house with amenities for two persons. Two party rooms in adjoining buildings, with kitchen and country sauna. A country home 5 minutes from Kuldīga. On the 2nd floor - 4 double bedrooms with shower and WC. On the 1st floor - a living room with fireplace, a dining room, and a large and cosy double bedroom with en suite shower and WC. Trout and carp in the local pond. Seminars for small groups can be organized. The Hostel „Vītoli” is situated 3 km from the Cape Kolka, where the Riga Bay meets the open sea – the Irbe Strait, within the territory of the Slītere National Park. Offer light and cosy double rooms to guests, also a two bedroom option for a family. There is a fire place to spend a chilly evening at with a cup of hot tea or coffee. In case you would wish to prepare a light meal – there is a kitchen with a gas stove, a fridge and some essential dishes. There is a common shower and WC. A holiday village right on the seashore, between Roja and Kolka - for family holidays, banqueting, wedding parties, sports and corporate events, conferences. The complex contains: a guest house with 12 rooms, a restaurant, seating 60, nine family log cottages with DBL and SGL beds for 6 persons, a family cottage "de luxe" with a sauna an Jacuzzi in open air. A house for festivities and conferences (70 pers.) with 2 saunas, a pool and 7 DBL rooms. A VIP house with 2-storey apartments, sauna and fireplace room. Sports grounds, tent sites, caravan site, well equipped children playgrounds, a roofed open air stage. Village pub not far from Palanga and Kretinga. Local bear brewery. Guest rooms with all amenities above the bar as well as coasy rooms in a separate motel with WC and shower in corridor. Carousels for children, trampolines. A family farm near the sea and by a bicycling route between Palanga and Šventoj. Five weekend flats, each with a kitchen and lavatory. Lovely parlour and rest areas in the garden. Guest house on the Salaca River. Banquets and accommodation for up to 100 pers. Conference and seminars services. Sauna in a separate building for parties up to 40 participants (sleeping on straw-filled mattresses on the upper floor). Children camps. Sports facilities and a pool. A ring for mud fights. Ideal stopover for cyclists. Fishing. The site hosts a yearly fishing competition Staiceles Vimba. Boat, float or canoe rides on the river. A guesthouse with an open-fire hall for seminars and banquets. 5 well equipped rooms in a guest house, 7 facilitated holiday houses for 6 persons and 20 places for trailers (electricity supply) and a separated building of amenities. Rustic bathhouse for up to 15 persons with services of bathhouse attendant and masseur available. Fishing possibilities. Different sports courts and equipment available. Recreation possibilities for families with children. A log house with a fireplace room for up to 10 persons, sauna and country sauna on the banks of the Ligatne river in Gauja National Park. Bedrooms on the 2nd floor. Hunting, skidoo and paddle boat rentals. A country house near Ēdole, by the Lake Pinku. A large cottage: living room with kitchen, sauna, 2 bedrooms. Part of the owners' home with a separate entrance for guests - living room with a fireplace, bedroom, amenities. A weekend house amid bodies of water – a place for undisturbed leisure and enjoyment of the beauty of nature. Our guests have access to a pond, a country sauna, a fireplace room and a bedroom. Lovers of active leisure can go fishing, lease boats and look for birds. Hotel 5 km from Roja town. Seminar rooms, party rooms, billiards, a fireplace hall, sauna and Turkish bath, an immersion pool, café. A farmstead 14km from Limbaži where guests can take part in farmwork, learn to gather herb teas, enjoy a real country sauna with inhalations of herbal vapours. Rooms for guests in the hosts' home or in the former barn. Great holidays by waters for nature lovers. A house on the river bank. Sauna and, amongst the water lilies in the pond, an island with a fireplace. The sea and a secluded beach 8 km. Excursions in the Saka district. By the sea, between Kolka and Ventspils. Cottages, 50 places for trailers, 1000 places for tents. WC, bonfire places with firewood, barbecue, tables, sports grounds, childrens' playgroung, car parking. In the season, a cafe is open offering beer and snacks. Meal services upon prior request. Leisure in the countryside, 12 km from Krāslava. Horseback riding, tours, trips in carts and sleighs, boating and rafting at the "Curves of Daugava" nature park on the border with Belarus. A cottage with country sauna, 26 km from Rēzekne. Living room and kitchen. Double bedrooms on the first and second floor. Outdoor fireplace, picnicking alongside the pond. Fishing on several lakes in the area. Swans on Lake Rāzna and Lake Kaunata. A part of the house for guests’ use. A sitting room with a fireplace, a kitchen, 2 bedrooms and WC/shower facilities on the 1st floor. 3 DBL or twin bedrooms and a small sitting room on the 2nd floor. Fishing in the ponds or in the Aiviekste river. A country home on the bank of the Svētupe River. A fireplace room and sauna, bedrooms on the 2nd floor. A separate building for parties. Carp fishing in stocked pond. Fishing also in the rivers. Canoes and sea kayaks for rent. Boat rent for fishing. A holiday complex by the lake Rāznas. There are 4 party facilities: “Apelsīns” and “Citrons” each offering accommodations for 30 guests, a kitchen or cafe, a sauna; “Pīlādzis” - a cottage with Russian sauna and 3 en-suite bedrooms and outdoor Jacuzzi, a fireplace room for 15 persons; a family cottage “Odziņa” – Russian sauna for 15 persons and one bedroom on the 2nd floor. On the riverside of Venta river, close to Skrunda parish, the building of a former manor house the accommodation is offered for the explorers of Kurzeme tourists. Twelve simple rooms. An ancient home with a reed roof, in a quiet location 3 km from Ēdole. Large 4-bed en suite . On the 1st floor - a small steam sauna and fireplace room for 10. Fishing in three ponds alongside the house. A modern camping in ventspils city, on the Baltic seacoast. 43 well appointed cottages (26 of them have heating and operate in also in winter). The cottages have 2 rooms and 4 bed places. Well appointed tenting grounds. Shared shower and WC, kitchen and laundering room. On the foothills of Kamparkalns, the highest hill in Kurzeme, a well appointed cottage with a fireplace room and sauna. In the winter - two ski lifts and skiing equipment rentals. Jarina, cooperative for rural development (Jarina, zadruga za razvoj podeželja) is organization, which connects local producers and consumers and ensures provision of healthy food produced in network of local food (fruits and vegetables). Jarina is also registered as incoming travel agency. Opportunities for cooperation are different tourism programmes in the field of active tourism. Notranjska ecological centre (Notranjski ekološki center) is non-profit institution that works in the areas of entrepreneurship, education, sustainable development and rural development. The centre is also registered as an incoming travel agency. Opportunities for cooperation are different kinds of active tourism, such as caving, biking and hiking. AREA GEA is an institution for development and education. They organize various educational programs for art and science days for schools. They include volunteers, which instead of paying programms combine the cost with work on the farm. Opportunities for cooperation are implementing training programs and thematic tourism. Centre for Sustainable Rural Development Kranj (Center za trajnostni razvoj podeželja Kranj) is a non-profit development organization. Main areas of their activities are sustainable development of small businesses and new employment, tourism development, efficient and sustainable use of local resources and energy, education and awareness on sustainable development in rural areas. Opportunities for cooperation are organization and implementation of different training. Škocjan Caves represent the most significant underground phenomena in both the Karst region and Slovenia. Caves are managed by institution that participates in international projects, it is also responsible for public presentation of the park, maintaining the infrastructure for visiting mine pits and provides guide service in the park. Opportunities for cooperation are thematic workshops and the implementation of adrenaline tourist programs. Tourist Association Šentrupert (Turistično društvo Šentrupert) represents tourism of municipality Šentrupert, which is located in Dolenjska region in Slovenia. Association engages in the promotion of the main local attractions, which are: church of st. Rupert, an outdoor museum with hayracks and hiking trail »Steklasova pot«. Opportunities for cooperation are in the field of tourism, particularly in connection to the outdoor museum with hayracks. Association for Rural Development LAZ (Društvo za razvoj podeželja LAZ) deals with rural development in the local area of Jablaniška valley, whish is located in the municipalities Šmartno pri Litiji and Litija in central Slovenia. It's mission is to contribute to the fulfillment of the European programme for Rural Development. The objectives and tasks of the Association are activities for the improvement of rural life in all elements of living. Opportunities to cooperate in the future are especially in active tourism. The Lipica Stud Farm (Kobilarna Lipica) is the cradle of all Lipizzaner horses in the world. Nowadays it is one of the most beautiful cultural and historical monuments of the Republic of Slovenia, its rich history reaching back to the year of 1580. It has been boasting of the tradition of breeding and selecting pure-breed horses. In the 1960’s the Lipica Stud Farm established the Classic Riding School which still participates in worldwide equestrian events. Mašun guesthouse (Gostišče Mašun) is located in a village Mašun, near Loka Valley, in southwestern Slovenia. Visitors of the guesthouse have a lot of opportunities for active leisure, they can choose between cycling trails, hiking in the surrounding hills and vacation in nature. Opportunities for cooperation are in the field of active tourism. Municipality Šentrupert (Občina Šentrupert) is one of the smallest, but most successful and ambitious municipalities in Slovenia. The population is 2400 inhabitants. It is located in the central part of the Mirna Valley in the central Dolenjska region. The area has many opportunities for recreation - especially hiking and biking. In the village of Slivna, near the geometric centre of Slovenia (GEOSS), a new adventure park (Pustolovski park Geoss) for children and adults opened its door in July 2011. Visitors can rise from the ground up to the tree crowns and experience a great adventure. Priložnosti za sodelovanje so na področju aktivnega in zelenega turizma. Opportunities for cooperation are in the field of green and active tourism. Umanotera is an organization from Ljubljana, which is translating the principles of sustainable development into a way of life by introducing examples of inspiring good practices and increasing the availability of benevolent products. Through its activities Umanotera fosters the values of entrepreneurship, creativity, partnership and quality. Opportunities for cooperation are in the field of in the field of green tourism and sustainable development. AA-Press is a media company with established brands: tourism web portal and radio show Good Morning Slovenia, Campaign Best spa, Best Ski resort, Best Wellness and Best Camp, journal Family adventure, annual Camping&Caravanning Guide of Europe and specialized fair Camping&Caravanning in Ljubljana. Opportunities for cooperation are in the field of active tourism. The farm is located at the edge of the Pivka valley and boasts a beautiful view over the Pivka valley and the Nanos hill. In 2010, it won an award for most beautiful tourist farm. The owners are connoisseurs of traditional cuisine, such as yota, minestrone, kohlrabi and homemade bread. The owner Marko has an excellent knowledge of medicinal plants and herbs, which he uses to make premium liqueurs and other interesting beverages. The Dolsko Tourism Society consists of local residents, who implement different activities. The most popular event which they hold each year is the Autumn Fair in Dolsko, where local food producers, craftsmen and other local agents present themselves. The Sports Society Dole pri Litiji is one of the many active societies in the Charcoal Land. It manages a small local ski slope and organises a traditional hike along the charcoal trail, which is held every year in May. Visitors can thus get acquainted with charcoal making and many natural sights. The Dolina Sports Society was founded in 1974 so that people of the valley Jablaniška Dolina would be able to engage in leisure activities. For this reason the society obtained a land in Reka and built a football field and later also a sand volleyball court. In winter, there is a ski race track and a ski lift for locals to use. The society has been active for almost 100 years. Their goals are continuous learning, honey quality, to introduce a common trademark, accelerate retail, get youth interested in beekeeping and to connect with domestic as well as foreign societies. They also gave the initiative to establish a beekeepers class at Dragatuš Primary School, which they help lead. The tourism society was founded in 2003 and organises cleaning campaigns, the event Goulash of May 1, the celebration held on the evening before the National Day, etc. In 2005 the general assembly also decided to open the church to visitors. The society carried out numerous cleaning campaigns, which were very successful.